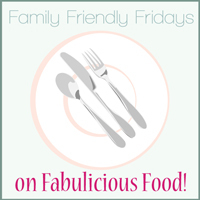 During May I hosted Family Friendly Fridays on behalf of Ren over at Fabulicious Food. The theme this month (as this is a vegetarian food blog!) was of course Vegetarian Family Friendly food. We had ten absolutely fabulous entries this month, and I also linked up a couple of my own recipes. The link-up began with a lovely Spinach and Feta Pastitsio from Shaheen over at Allotment to Kitchen. 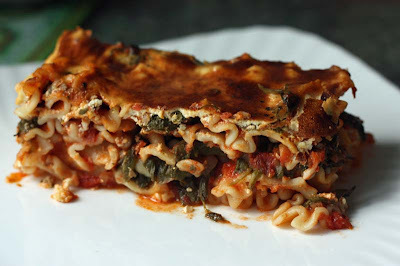 This is a very interesting Greek-inspired pasta dish which I will definitely be giving a go. Thanks so much for entering Shaheen! Next to enter was Katie Over at Feeding Boys and a Firefighter. 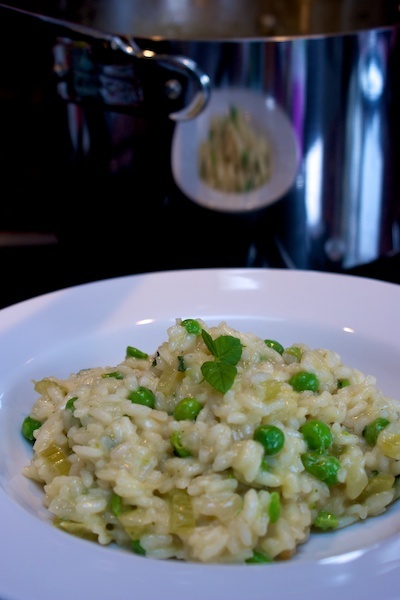 Katie entered a delicious Pea and Mint Risotto. I love the flavours in this dish as I think that they encapsulate the taste of spring perfectly (even though the weather is far from spring like today) However, on a warm sunny day, this would make a fabulous family meal. I also love the reflection of the dish in the background of the picture - great photo! Thanks for entering Katie. Emma at Emma's Kitchen Diary submitted some delicious Potato Wedges. Our family absolutely loves Potato Wedges and I make them at least once a week. We love experimenting with different herbs and spices to flavour them. Emma has used fresh Rosemary to flavour hers, I find that thyme, garlic, and sea salt works well too. Thanks for entering Emma! Another Emma, from Souperior sent in a recipe for Aqua Cotta. Aqua Cotta is an Italian Peasant Soup born out of poverty as the name of the dish literally means 'Cooked Water'. This dish is delicious, frugal, vegetarian and also vegan. Thanks so much for entering such a lovely soup Emma! I linked my Mixed Noodles this month. My kids love Noodles and we eat a lot of them. I have included Nuts in my dish for protein. 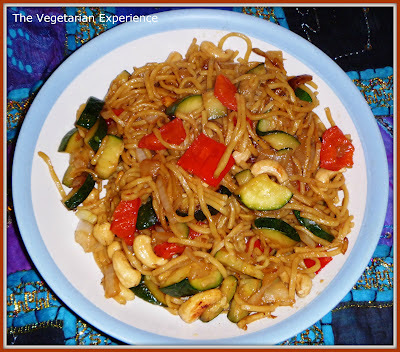 I also used pepper, courgettes and onions in the dish and a little soy sauce to flavour it. This is one of our staple family meals. You can use any vegetables you have to hand. Nipping over to the other side of the world and Australia now. 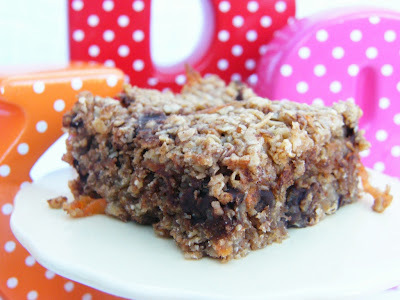 Johanna from Gourmet Green Giraffe entered her Zucchini slice with Facon into the link-up. Zucchini is better known as Courgette in the UK (although Zucchini is much more interesting! ), Johanna's dish also contains Facon - a Tofu Bacon which I have yet to find in the UK but I believe similar exists, This dish is a reminder of Johanna's childhood and is definitely a great family dish - Thanks for entering Johanna. Caroline over at Cakes, Crumbs and Cooking sent in her Sweet Potato Bread (Yeasted) Bread. This bread isn't sweet, but the potato used to make it is. This bread is great for kids as the crust is not too crunchy. I have a huge weakness for bread and this loaf looks delicious so I will be trying this in the future. Thanks for entering Caroline. Becky over at Mint Custard sent in a delicious recipe for Panzanella. I love Panzanella as it is so simple to make but tastes so delicious. Becky is fairly new to blogging, so do pop over to her site and have a look at her fab recipes. 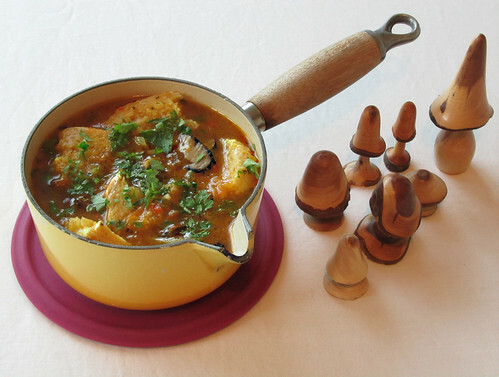 Another recipe from me - This time a Quorn Chicken and Tomato Hotpot. I created this recipe and a selection of other recipes for National Vegetarian Week. 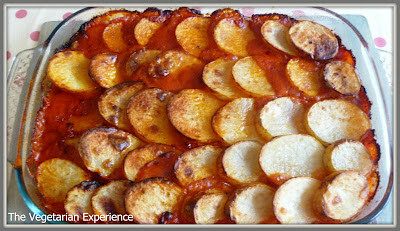 Based on a traditional bolognese, I omitted the mince for Quorn chicken and also layered sliced potatoes over the top. 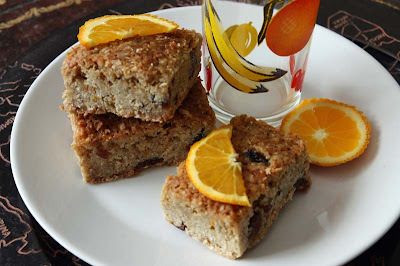 Orange and Raisin Flapjacks. These look really appetising and would be a great addition to any lunchbox. Thanks again Shaheen! Another fantastic addition for the kids lunchbox are these Carrot, Banana and Chocolate Chip Flapjacks sent in by Jac over at Tinned Tomatoes. These flapjacks look really delicious and are a fantastic way to sneak some healthy vegetables into the kids - what a great idea! Last but certainly by no means least, Resh over at Daily Cuppa entered this wonderful Chocolate Shortbread. I love cashews, pistachios and chocolate, so this recipe was right up my street. I'm not sure whether my kids would eat it with so many nuts on, but hubby and I would happily indulge in a slice or two. Thanks for entering Resh! So there you have it - twelve wonderful Vegetarian Family-Friendly recipes to try out. Thanks to all those who entered their wonderful recipes, and thanks to Ren for inviting me to host. Solange from Pebble Soup is hosting this months round of Family Friendly Fridays, so do pop over and link up a family friendly recipe this month too! I wish I had seen this before, I have a few family friendly veggie dishes that I would have included. Great blog!